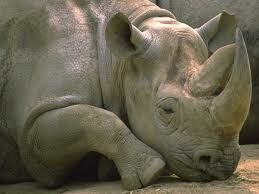 How do you wake a sleeping rhino? That innocent question was posed recently to a zoo staffer. Well, it got me to thinking. Not of sleep-deprived rhinos, but to the zombie-like state we go thru when we stumble thru a dead-end job. Just how do you know when it’s time to go? From my experience in radio, I might be able to help. If you consider that many careers in radio are short-circuited every two years – thanks to budget cuts and/or a format switch from country music to All-Talk Radio in Swahili – I’ve been thru this once or twice. You’ve suddenly been transferred to an isolated bureau that you had not even been aware existed. And, you would need a passport to get there. Your boss throws a pink paper airplane your way as you exit your cubicle. Then, he beats feet down the hall. From your vantage point, several yards behind, you hear the unmistakable sounds of multiple locks clicking into place right after he slams the door. You had considered leaving. The warning signs were all there. The only voices your boss listened to were those inside his alleged mind. You viewed the end of each weekend with a face usually reserved for mourners at a funeral. As the alarm rang, you’d smack the snooze alarm – hoping for a reprieve. Even if it only was for 5 minutes more. But you were in a comfort zone, a rut that only got deeper each year. Afraid to go. Loathing to stay! So, just how do you wake that sleeping rhino? This is what the staffer said they do at the zoo. Clap real loud. Then, my recommendation would be to run like the dickens for the nearest exit and make a move for a more satisfying goal line.